Dozens of pre-created page templates for topics like work, family, sports, finance, entertainment, education and much more. Now it takes just a mouse click to add a whole page with the best modules for a certain topic area. A Feed Directory and a Podcast Directory with hundreds of news feeds and podcasts from all over the world and for almost every category. A new Pageflakes community environment at www.pageflakes.com/community which allows you to search, submit, rate and discuss flakes and do much more. Setting up a shared page with other users is now easier than ever. A Public Pages Gallery of all the pages which Pageflakes users have published. TechCrunch today profiled a new comparison shopping site called Ugenie. What makes Ugenie different from most (all?) other similar sites is that the service not only finds the best price on a single item but also the best total price on any bundle of books, CDs, DVDs or games that you happen to be interested in. Ugenie finds the best bottom-line prices for you, taking into account shipping costs, taxes and discounts. What's more, the service also takes into account that sometimes it's cheaper to pay all items from one merchant but in other cases it's cheaper to spread an order across several shops. If you think about the number of possible combinations to buy, say, five items from 35 shops, that's quickly becoming pretty complicated. And remember that in addition to the plain item prices, Ugenie also needs to take into account shipping costs, which can depend on various factors like the number of items, the order price and the order weight, or a combination thereof. The fact that taxes can depend on the location of the shop as well as the location of the customer doesn't make it easier. 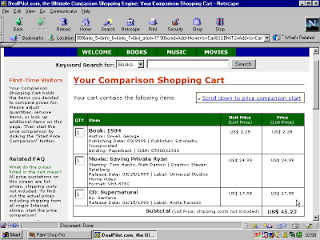 What you're seeing here is the "Comparison Shopping Cart" (that's how we coined it) of a user who's looking for a book, a movie (no, not a DVD, a VHS cassette!) and a CD. If the user scrolls down he'd see a list of all offers, taking into account all those factors described above. Don't worry guys, we didn't patent it. Good luck with Ugenie!